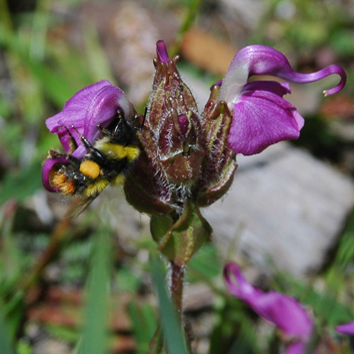 If you share a pollinator with another plant species in your location, is it a good idea to flower at the same time? You can only use pollen from another plant in the same species. If a bee arrives loaded with another species’s pollen, then what you get is junk. Similarly, if you load a bee with pollen, and it doesn’t visit another flower of your species, you’ve wasted your effort. On the other hand, if you’re next to a more attractive species, you might get more visits than you would alone. You get poorer quality pollen, but so much more quantity. What’s better? It’s a puzzle that Thomson and colleagues have been trying to solve, and they got help from some bees and artificial flowers. They used ‘species’ of artificial flowers – one more rewarding than the other. They then changed the intermingling of the flowers to see what happened. Artificial flowers don’t have pollen or nectar, so left alone you’d just have frustrated bees. Thomson’s team used sucrose solution to reward bees. They tracked the bees using food dyes. (A) Illustrations of the cosexual artificial flowers used in the experiments. 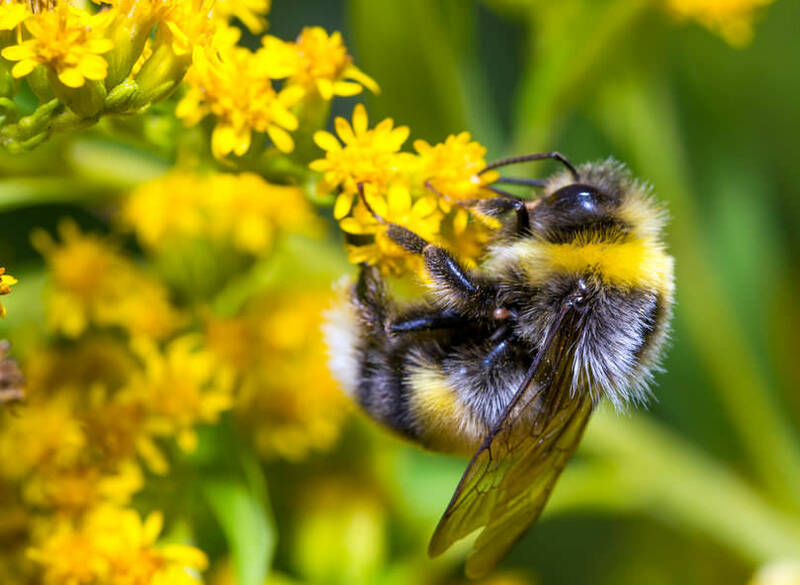 The flowers attract visits from bumble-bee workers by offering sucrose solution at a nectary that is continuously replenished by capillary action. ‘Sexual organs’ are housed in a plastic superstructure, formed by 3-D printing, that is positioned over the nectar cup by a piece of tape serving as a hinge. The flowers receive and transfer pollen analogue dye when a bee pushes under the hinged superstructure: the sticky tape stigma picks up dye and a slit in the dye chamber sifts dye on the back of the bee. (B) Spatial arrangement of artificial flowers designed to represent an idealized transition zone between two plant species. Blue and yellow flowers provide 1.4 M and 0.6 M sucrose, respectively. The authors found that the less attractive flowers got more visits, as predicted, when next to the more attractive flowers. However, the pollen was lower quality. The trade-off between quality and quantity cancelled each other out. That means there was no benefit nor loss for the less attractive flowers when surround by more attractive neighbours. The more attractive plants had a different result. They got a drop in pollen purity when among plants of another species. Worse, the less attractive neighbours reduced the visitors they would otherwise get. Thomson et al. describe the interaction as amensalism, where one species inhibits another, with no cost or benefit to itself. 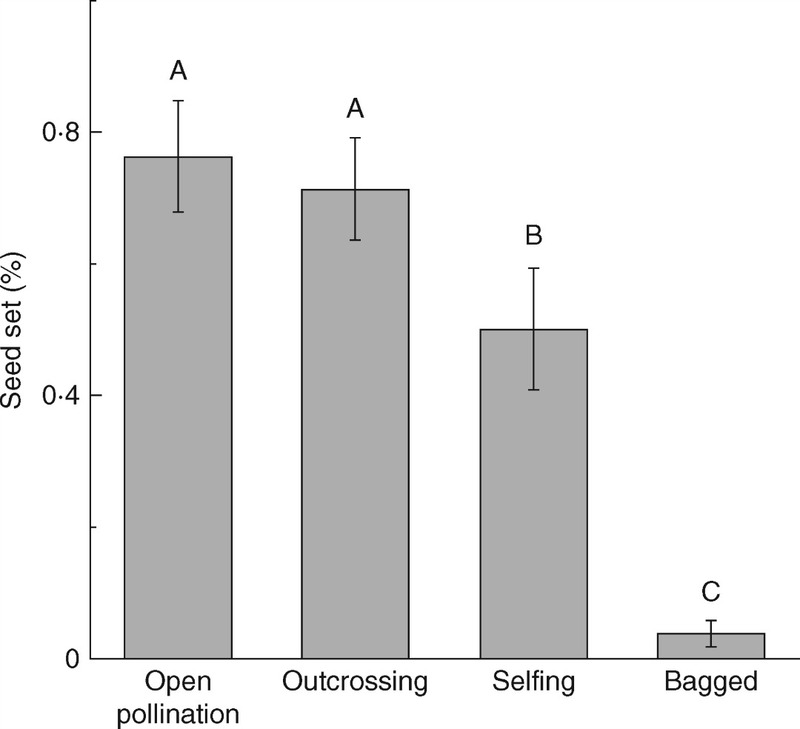 They conclude that spatial patterning of flower species is important in understanding pollination success. Future experiments, they say, could show that the less attractive flowers benefit, if they cluster the right way around their neighbours.